The sound boards are custom made and programmed! We can even custom program the sound board to act differently for your needs. Contact us for more info! This sound board interfaces with the counter to synchronize gun burst sounds to the ammo count and barrel flashers as seen on the PR counter page. 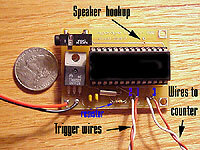 The sound board can be programmed with up to 5 different gun sounds as well as one gun empty clacking sound. You choose the sounds you want! 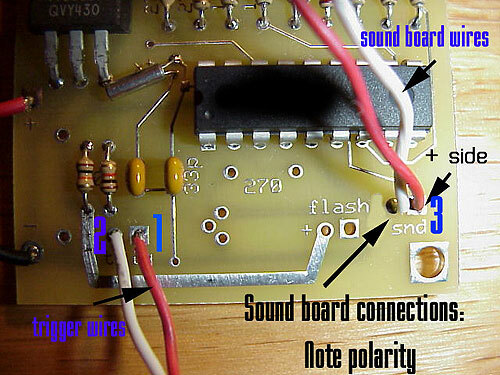 When the board is powered up and the trigger wires make contact, the counter will count down and the sound board will play out randomly selected gun burst sounds. The sound board will continue to string together gun burst sounds as long as the trigger wires are touching. When the counter expires at 00, the sound board plays out a looping gun "clack" sound to emulate out of ammo. You can also choose to have Marine chatter come over the airwaves if there is no activity for 15 seconds. This gives you the added realism that you have comrades in the field helping you out! We can also customize and program the sound board to fit your needs. Extra costs may be involved. Any standard wav file (up to 16sec worth!) can be recorded onto the sound chip which suits your prop. Contact us for more info!! The sound boards run off a 9V battery. They are fairly loud using a good-sized speaker with no extra amp needed. There is also an 1/8" audio out jack to connect up a different speaker or headphones. Headphone use may require a volume control cable, available from Radio Shack. This sound board cannot mix 2 or more sounds together. It is capable of playback only, and can only playback one sound at a time. 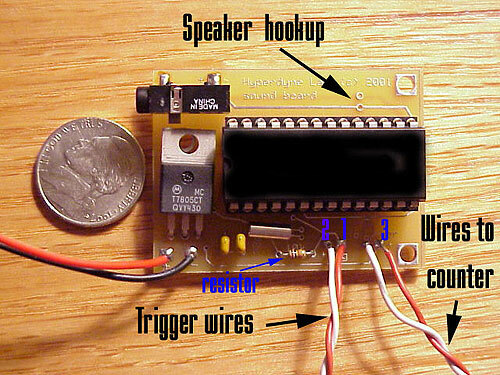 But, it can store many different sounds and play them out based on button presses, timer events, etc. We are offering this board as an affordable alternative to our Vortex USM. Hence its sound quality is not as crisp and clean as the Vortex USM. 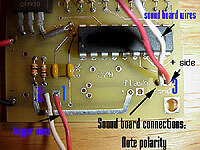 This board's frequency range is 150 Hz to 4kHz.